Turn up the heat! We are here with our top-of-the-line black steel / carbon steel cookware that are designed to last a lifetime. Our exclusive collection of carbon steel frying pans and crepe pans is developed to professional quality with the even heating performance. With high heat retention capability, they will get hot quickly and will retain hot temperatures for longer durations without hurting the nutrient value and flavor of the foods. From cooking hot juicy steaks, sauteed vegetables to braising short ribs, these carbon steel frying pans are sure to fit in all commercial or home kitchen requirements. All our black steel cookware boasts heavy-duty construction along with extra strong handles for ease of use. With proper seasoning, just one application of oil should be enough to make them nonstick. 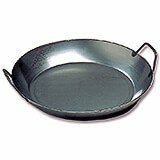 Black Steel Crepe Pan, Skillet Style 7"
Black Steel Crepe Pan, Skillet Style 7.87"
Black Steel Paella Pan, 14.12"
Curved sides, two handles, this pan has a wide and shallow cooking surface designed to saute meats and vegetables prior to adding rice. Should be "seasoned" for non stick use and prolonged life. Measurement: 14 1/8" Diam. x 1 5/8" H.Base Diameter: 11 1/4". Weight: 6 lbs. 2 oz. Black Steel Paella Pan, 15.75"
Curved sides, two handles, this pan has a wide and shallow cooking surface designed to saute meats and vegetables prior to adding rice. Should be "seasoned" for non stick use and prolonged life. Measurement: 15 3/4" Diam. x 2 1/16" H.Overall Length with handles: 17 1/4". Weight: 7 lbs. 6 oz. Black Steel Paella Pan, 17.75"
Black Steel Round Crepe Pan, 8.62"
Our incredible black steel fry pans are amazingly strong and made to last. Black Steel distributes heat excellently. Top features: Fry pans in black steel plate for all hob types. High quality extra strong steel strip handle. Heavy duty construction. Should be "seasoned" for non stick use and prolonged life. Measurements: 8 5/8" Diam. Weight: 1 lbs. 12 oz. 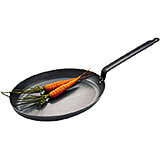 Black Steel Round Crepe Pan, 9.5"
Our incredible black steel fry pans are amazingly strong and made to last. Black Steel distributes heat excellently. Cooking surface is 7-7/8" Top features: Fry pans in black steel plate for all hob types. High quality extra strong steel strip handle. Heavy duty construction. Should be "seasoned" for non stick use and prolonged life. Measurements: 9 1/2" Diam. Weight: 2 lbs. 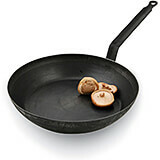 Black Steel Round Frying Pan, 10.25"
Our incredible black steel fry pans are amazingly strong and made to last. Black Steel distributes heat excellently. Top features: Fry pans in black steel plate for all hob types. High quality extra strong steel strip handle. Heavy duty construction. Should be "seasoned" for non stick use and prolonged life. Measurements: 10 1/4" Diam. x 2" H. Weight: 3 lbs. 11 oz. Black Steel Round Frying Pan, 11"
Our incredible black steel fry pans are amazingly strong and made to last. Black Steel distributes heat excellently. 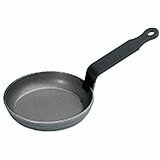 The pan bottom diameter 8" Top features: Fry pans in black steel plate for all hob types. High quality extra strong steel strip handle. Heavy duty construction. Should be "seasoned" for non stick use and prolonged life. Measurements: 11" Diam. x 2" H. Weight: 4 lbs. 2 oz. Black Steel Round Frying Pan, 11.87"
Black Steel Round Frying Pan, 12.62"
Black Steel Round Frying Pan, 14.12"
Our incredible black steel fry pans are amazingly strong and made to last. Black Steel distributes heat excellently. Top features: Fry pans in black steel plate for all hob types. High quality extra strong steel strip handle. Heavy duty construction. Should be "seasoned" for non stick use and prolonged life. Measurements: 14 1/8" Diam. x 2 1/2" H. Weight: 6 lbs. 14 oz. Black Steel Round Frying Pan, 15.75"
Our incredible black steel fry pans are amazingly strong and made to last. Black Steel distributes heat excellently. Top features: Fry pans in black steel plate for all hob types. High quality extra strong steel strip handle. Heavy duty construction. Should be "seasoned" for non stick use and prolonged life. Measurements: 15 3/4" Diam. x 2 3/4" H. Weight: 8 lbs. 2 oz. Black Steel Round Frying Pan, 17.75"
Our incredible black steel fry pans are amazingly strong and made to last. Black Steel distributes heat excellently. Top features: Fry pans in black steel plate for all hob types. High quality extra strong steel strip handle. Heavy duty construction. Should be "seasoned" for non stick use and prolonged life. Measurements: 17 3/4" Diam. x 3" H. Weight: 9 lbs. 8 oz. Black Steel Round Frying Pan, 8.62"
Our incredible black steel fry pans are amazingly strong and made to last. Black Steel distributes heat excellently. Top features: Fry pans in black steel plate for all hob types. High quality extra strong steel strip handle. Heavy duty construction. Should be "seasoned" for non stick use and prolonged life. Measurements: 8 5/8" Diam. x 1 1/2" H. Weight: 2 lbs. 12 oz. Black Steel Round Frying Pan, 9.5"
Our incredible black steel fry pans are amazingly strong and made to last. Black Steel distributes heat excellently. Top features: Fry pans in black steel plate for all hob types. High quality extra strong steel strip handle. Heavy duty construction. Should be "seasoned" for non stick use and prolonged life. Measurements: 9 1/2" Diam. x 1 3/4" H. Weight: 3 lbs. 1 oz. Black, Carbon Steel Oval Frying Pan, 15.12"
Black, Carbon Steel Oval Frying Pan, 9"
59" X 9" X 59"
Blue Steel Chestnut Roasting Pan with Extra Long Handle, 12" Diam. 32" X 12" X 8"
Blue Steel Chestnut Roasting Pan, 12" Diam. Blue Steel Paella Pan, Polished, 23.62"
23.62" X 23.62" X 2.25"
Blue Steel Paella Pan, Polished, 31.5"
31.5" X 31.5" X 2.62"
Blue Steel Paella Pan, Polished, 35.5"
35.5" X 35.5" X 2.88"
Carbon Steel Black Steel Frying Pan, 10.25"
10.25" X 10.25" X 2"
This 10 1/4 inch World Cuisine black steel frying pan has numerous benefits. The traditional black steel Lyon-shaped frying pan creates a generous food-to-heat ratio which allows for setting, scrambling and searing. The angled sides keep in steam and discourage dry frying. The flat, iron handle is solidly affixed. This particular style has a 3/64 inch to 5/16 inch (1.2 to 1.5 mm) thickness. Carbon Steel Black Steel Frying Pan, 11"
This 11 inch World Cuisine black steel frying pan has numerous benefits. The traditional black steel Lyon-shaped frying pan creates a generous food-to-heat ratio which allows for setting, scrambling and searing. The angled sides keep in steam and discourage dry frying. The flat, iron handle is solidly affixed. This particular style has a 3/64 inch to 5/16 inch (1.2 to 1.5 mm) thickness. Carbon Steel Black Steel Frying Pan, 11.88"
11.88" X 11.88" X 2.25"
This 11 7/8 inch World Cuisine black steel frying pan has numerous benefits. The traditional black steel Lyon-shaped frying pan creates a generous food-to-heat ratio which allows for setting, scrambling and searing. The angled sides keep in steam and discourage dry frying. The flat, iron handle is solidly affixed. This particular style has a 3/64 inch to 5/16 inch (1.2 to 1.5 mm) thickness. Carbon Steel Black Steel Frying Pan, 12.5"
12.5" X 12.5" X 2.25"
This 12 1/2 inch World Cuisine black steel frying pan has numerous benefits. The traditional black steel Lyon-shaped frying pan creates a generous food-to-heat ratio which allows for setting, scrambling and searing. The angled sides keep in steam and discourage dry frying. The flat, iron handle is solidly affixed. This particular style has a 3/64 inch to 5/16 inch (1.2 to 1.5 mm) thickness. Carbon Steel Black Steel Frying Pan, 14.12"
14.12" X 14.12" X 2.5"
This 14 1/8 inch World Cuisine black steel frying pan has numerous benefits. The traditional black steel Lyon-shaped frying pan creates a generous food-to-heat ratio which allows for setting, scrambling and searing. The angled sides keep in steam and discourage dry frying. The flat, iron handle is solidly affixed. This particular style has a 3/64 inch to 5/16 inch (1.2 to 1.5 mm) thickness. Carbon Steel Black Steel Frying Pan, 15.75"
15.75" X 15.75" X 2.75"
This 15 3/4 inch World Cuisine black steel frying pan has numerous benefits. The traditional black steel Lyon-shaped frying pan creates a generous food-to-heat ratio which allows for setting, scrambling and searing. The angled sides keep in steam and discourage dry frying. The flat, iron handle is solidly affixed. This particular style has a 3/64 inch to 5/16 inch (1.2 to 1.5 mm) thickness. Carbon Steel Black Steel Frying Pan, 17.75"
17.75" X 17.75" X 3"
This 17 3/4 inch World Cuisine black steel frying pan has numerous benefits. The traditional black steel Lyon-shaped frying pan creates a generous food-to-heat ratio which allows for setting, scrambling and searing. The angled sides keep in steam and discourage dry frying. The flat, iron handle is solidly affixed. This particular style has a 3/64 inch to 5/16 inch (1.2 to 1.5 mm) thickness. Carbon Steel Black Steel Frying Pan, 5.5"
This 5 1/2 inch World Cuisine black steel frying pan has numerous benefits. The traditional black steel Lyon-shaped frying pan creates a generous food-to-heat ratio which allows for setting, scrambling and searing. The angled sides keep in steam and discourage dry frying. The flat, iron handle is solidly affixed. This particular style has a 3/64 inch to 5/16 inch (1.2 to 1.5 mm) thickness. Carbon Steel Black Steel Frying Pan, 6.25"
6.25" X 6.25" X 1.5"
This 6 1/4 inch World Cuisine black steel frying pan has numerous benefits. The traditional black steel Lyon-shaped frying pan creates a generous food-to-heat ratio which allows for setting, scrambling and searing. The angled sides keep in steam and discourage dry frying. The flat, iron handle is solidly affixed. This particular style has a 3/64 inch to 5/16 inch (1.2 to 1.5 mm) thickness. Carbon Steel Black Steel Frying Pan, 7.12"
7.12" X 7.12" X 1.5"
This 7 1/8 inch World Cuisine black steel frying pan has numerous benefits. The traditional black steel Lyon-shaped frying pan creates a generous food-to-heat ratio which allows for setting, scrambling and searing. The angled sides keep in steam and discourage dry frying. The flat, iron handle is solidly affixed. This particular style has a 3/64 inch to 5/16 inch (1.2 to 1.5 mm) thickness. Carbon Steel Black Steel Frying Pan, 7.88"
7.88" X 7.88" X 1.62"
This 7 7/8 inch World Cuisine black steel frying pan has numerous benefits. The traditional black steel Lyon-shaped frying pan creates a generous food-to-heat ratio which allows for setting, scrambling and searing. The angled sides keep in steam and discourage dry frying. The flat, iron handle is solidly affixed. This particular style has a 3/64 inch to 5/16 inch (1.2 to 1.5 mm) thickness. Carbon Steel Black Steel Frying Pan, 8.62"
8.62" X 8.62" X 1.62"
This 8 5/8 inch World Cuisine black steel frying pan has numerous benefits. The traditional black steel Lyon-shaped frying pan creates a generous food-to-heat ratio which allows for setting, scrambling and searing. The angled sides keep in steam and discourage dry frying. The flat, iron handle is solidly affixed. This particular style has a 3/64 inch to 5/16 inch (1.2 to 1.5 mm) thickness. Carbon Steel Black Steel Frying Pan, 9.5"
9.5" X 9.5" X 1.88"
This 9 1/2 inch World Cuisine black steel frying pan has numerous benefits. The traditional black steel Lyon-shaped frying pan creates a generous food-to-heat ratio which allows for setting, scrambling and searing. The angled sides keep in steam and discourage dry frying. The flat, iron handle is solidly affixed. This particular style has a 3/64 inch to 5/16 inch (1.2 to 1.5 mm) thickness. 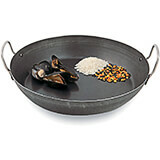 Carbon Steel Black Steel Paella Pan, 11"
This 11 inch World Cuisine black steel paella pan has numerous benefits. The depth and flared sides of this pan make it easy to cook paella, as the shape encourages the quick evaporation of liquid. The pan is constructed of black steel with dual handles. 8 inch cooking surface. 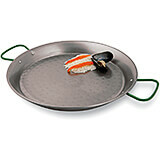 Carbon Steel Black Steel Paella Pan, 12.5"
This 12 1/2 inch World Cuisine black steel paella pan has numerous benefits. 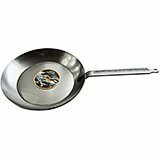 The depth and flared sides of this pan make it easy to cook paella, as the shape encourages the quick evaporation of liquid. The pan is constructed of black steel with dual handles. Carbon Steel Black Steel Paella Pan, 14.13"
14.13" X 14.13" X 2.5"
Carbon Steel Black Steel Paella Pan, 15.75"
Carbon Steel Black Steel Paella Pan, 17.75"
This 17 3/4 inch World Cuisine black steel paella pan has numerous benefits. The depth and flared sides of this pan make it easy to cook paella, as the shape encourages the quick evaporation of liquid. The pan is constructed of black steel with dual handles. Carbon Steel Black Steel Paella Pan, 19.62"
19.62" X 19.62" X 3.12"
This 19 5/8 inch World Cuisine black steel paella pan has numerous benefits. The depth and flared sides of this pan make it easy to cook paella, as the shape encourages the quick evaporation of liquid. The pan is constructed of black steel with dual handles. Carbon Steel Black Steel Paella Pan, 7.88"
This 7 7/8 inch World Cuisine black steel paella pan has numerous benefits. The depth and flared sides of this pan make it easy to cook paella, as the shape encourages the quick evaporation of liquid. The pan is constructed of black steel with dual handles. Carbon Steel Black Steel Paella Pan, 9.5"
This 9 1/2 inch World Cuisine black steel paella pan has numerous benefits. The depth and flared sides of this pan make it easy to cook paella, as the shape encourages the quick evaporation of liquid. 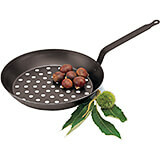 The pan is constructed of black steel with dual handles. 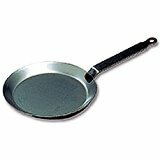 Carbon Steel Blini Pan, 4.75"
This 4 3/4 inch World Cuisine carbon steel blini pan has numerous benefits. 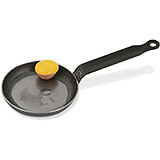 This pan is suited to making the well-known blini as well as pancakes. It is made of carbon steel. Carbon Steel Crepe Pan, Polished 10.25"
10.25" X 10.25" X 0.63"
This Paderno World Cuisine 10.25 inch blue carbon steel crepe's thickness allows for longer pre-heating which results in a hotter surface for quickly singeing the crepe. It has remained unchanged since the early seventeenth century. 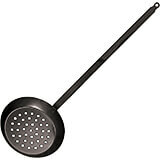 It is made of carbon steel with a 1/8 inch thickness for beater heat distribution. It has a flat iron handle. 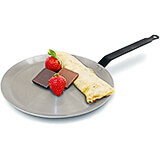 Carbon Steel Crepe Pan, Polished 4.75"
This 4 3/4 inch World Cuisine carbon steel crepe pan has numerous benefits. This heavy duty crepe pan's thickness allows for longer pre-heating which results in a hotter surface for quickly singeing the crepe. It has remained unchanged since the early seventeenth century. It is made of carbon steel with a 1/8 inch thickness for beater heat distribution. It has a flat iron handle.